What is RFID? What is NFC? What is the difference between RFID and NFC? These questions come up time and again, so let me answer them in some detail. Let’s start with the older term: RFID is just “radio frequency identification”. It’s not really defined, beyond being a combination of the two attributes, and, if you are so inclined, you could cite the “Identification Friend or Foe” systems invented for military airplanes in the 1930s as one of the earliest RFID systems1. The transponder could be active (have its own power source) or passive (be energized by the reader using some physical effect), the latter is what’s on most peoples minds in the context of RFID. A passive transponder can be communicated with with radio waves through radar backscatter (ultra-high frequencies, range in the hundreds of meters, very little power available to the transponder) or, more often seen in everyday life, be inductively coupled (low to high frequencies, range less than a couple meters, possibly high power available). An inductively coupled transponder could operate on a non-standardized low frequency (LF, ~120-140kHz) in a proprietary system, the standard high frequency (HF, 13.56MHz) in a proprietary system, or, most uses of the term RFID, the 13.56MHz frequency using an ISO standardized protocol. The 13.56MHz RFID ISO protocols are ISO 15693, vicinity coupling, defined range less than a meter, and, more often referenced in the context of “RFID”, ISO 14443, proximity coupling, defined range less than ten centimeters. Different properties of these general approaches lead to a very domain specific understanding of what “a normal RFID system” is: Warehouse management applications sometimes deal with ISO 15693 and more often with Gen 2 EPC (ISO 18000-6, passive backscatter, UHF: 860-960MHz). Average consumers overwhelmingly find themselves confronted with ISO 14443 systems (electronic passports, credit cards, newer corporate IDs) or proprietary HF systems (many corporate IDs). Finally, most very simple or moderately old applications quite often work with proprietary LF systems. It’s a shaky definition process, but at least once you have determined that you are talking about ISO 14443 you’re on quite firm ground. However, this only gets you to establish communication with a transponder, possibly gather a transponder specific unique identifier, and transmit bytes back and forth. The actual command set for reading and writing, and potentially other functions such as electronic purse applications, is a completely different horseride altogether. NFCIP-1, also known as ISO 18092 (dual-published as ECMA-340 [PDF]), which is an air interface for half-duplex communication between two entities using inductive coupling on 13.56MHz, at least one of the entities must be actively powered. A couple of RTDs that define both the message format and expected semantics of common use cases such as smart posters, business cards, etc. How do RFID and NFC relate? Now comes the fun part: NFCIP-1 is, not by accident, compatible with ISO 14443, where appropriate. Full-on NFCIP-1 devices generally can implement both sides (now called Initiator and Target) of the communication, and so are compatible both with ISO 14443 readers (by emulating a tag) and ISO 14443 tags (by behaving as a reader). As an aside: Most vendors, while they’re on the 13.56MHz frequency anyway, also implement all the usual 13.56MHz RFID protocols in the things they call NFC chipsets, which is not at all helpful when trying to untangle the standards salad. Just because your “NFC phone” can operate with a certain tag does not mean that it’s “doing NFC” in a certain narrowly defined sense. And even better: The NFC tag types correspond to existing 13.56MHz RFID tag products, but sometimes in a generalized version. For example tag type 2 is essentially NXP Mifare Ultralight3, but where Ultralight has a fixed 64 bytes of memory, the tag type 2 also allows arbitrary sizes bigger than 64B. And indeed, one of the most ubiquitous “NFC tag”s that you can buy now are NFC type 2 tags which are not NXP Mifare Ultralight and have ~160 bytes of memory. 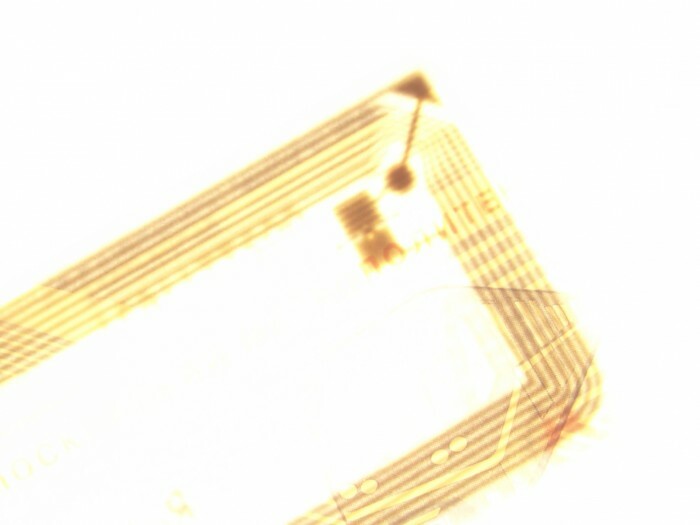 In conclusion, by NFC most people mean, depending on context, a tag type or message format from the NFC ecosystem, or the NFC chip in their phones, even when they are using it with any old ISO 14443 tag4, which, closing the loop here, is what most people mean when they are referencing RFID.